We enter into contracts every day for business and personal reasons. Some of these contracts are written, while others are oral. In every case, it is important that the terms of the contract are fairly negotiated, properly drafted, and reviewed to ensure the contract meets the intentions of the parties. MIS Provides legal contract drafting services. Negotiating for a remedy within the contract in the event there is a breach by either party may save time and expense down the road. “Form contracts” and contracts with the language and terms already set. A common example of when form contracts are those used is in landlord-tenant agreements. When using form contracts, parties usually do not negotiate. This makes it essential to carefully review the terms of the contract in order to be aware of the rights and responsibilities imposed by the agreement. Many parties may want to tailor a form contract to their needs, and will use the form contract as a model. When drafting the contract, it is important that each party knows exactly what is expected of them. If there are any words that could be misconstrued, or any terms that are ambiguous, parties should be sure to define them within the contract. Ultimately, when drafting a contract, clarifying the terms and duties should be the goal. Many parties use legal words and language, known as “legalese,” when drafting contracts. However, this may, make the obligations and terms of the contract confusing. Using regular language will insure that both parties understand what the contract says and means, and therefore understand what they are agreeing to. 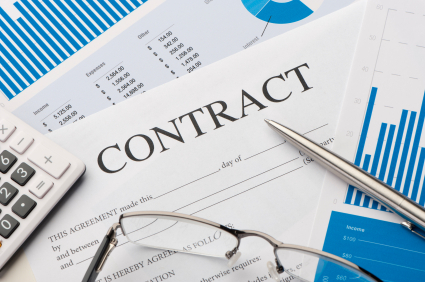 It may sound obvious, but before signing a contract, each party should read it. In reviewing the contract, parties need to make certain they understand the stated obligations are under the contract. If there is any uncertainty as to the duties of each party, and yet they signed the contract, they may be liable forbreaching the contract. Having a legal professional review the contract terms will ensure that the needs of each party will be met and that no party will obligate themselves unexpectedly.